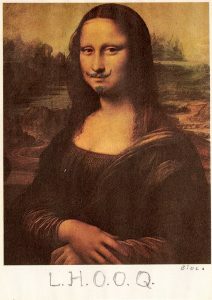 Marcel Duchamp’s rendering of the Mona Lisa, L.H.O.O.Q. (1919), prompting questions about moral rights. The Diploma in Intellectual Property and Collections will run again in London for three days from 24 to 26 June 2019. A new version of the course will also run in Sydney, Australia from 17 to 19 July 2019. The course will cover all aspects of intellectual property (IP) law affecting collections and collection management, including copyright in artistic works, permitted uses such as fair dealing, copyright duration, international and cross-border considerations, good IP management practice, digitisation, moral rights, the artist’s resale right, trade mark, breach of confidence and the impact of Brexit on the IP landscape. The teaching will be led by IAL Assistant Director Alexander Herman and Senior Researcher Emily Gould. Examination will be by oral assessment at the end of the course and by written assignment, due several weeks after the completion of the course. The course is open to legally-trained and non-legally-trained alike. It will be eligible for CPD points. The London course will be hosted at the Centre for Commercial Law Studies at Queen Mary, University of London, 67-69 Lincoln’s Inn Fields, near Holborn Station in central London. The cost is £888.00 (inc. VAT). The Sydney course will run at the University of Sydney Museum, Manning Road, Sydney, NSW 2050. The cost is $1,800.00 AUD (+GST). If you are interested in booking a spot on the London course, download the application form and return it to us. For the Sydney course, bookings are to be made through the Australasian Registrars Committee. This entry was posted on January 17, 2019 by IAL Admin.